Delicious, creamy yogurt. Source of calcium. Natural dairy goodness. No artificial colours, preservatives or sweeteners. 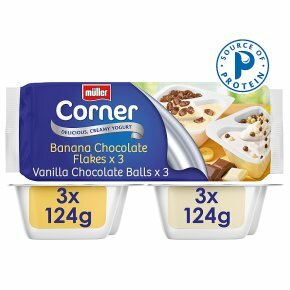 Suitable for vegetarians.Muller Corners are the perfect combination of delicious creamy thick yogurt with either fruit, chocolate or granola! With such a variety of delicious flavours for you and the family to enjoy, Müller Corner yogurts allow you the freedom to mix it your way wherever and whenever you want.